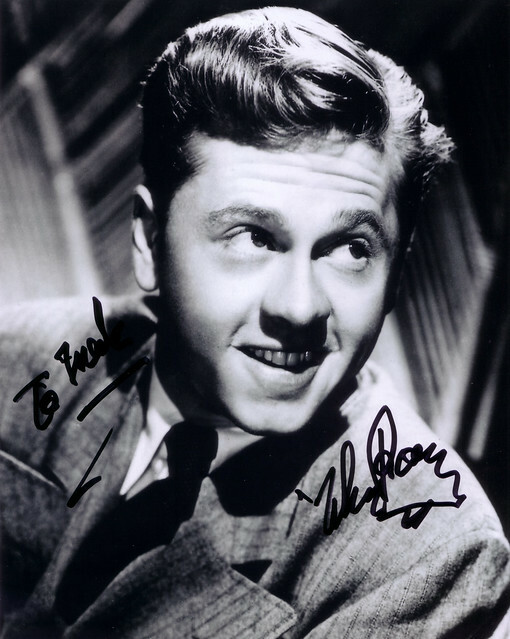 We continue our series on old Hollywood stars who passed away in 2014 with the legendary Mickey Rooney. Mickey Rooney was the ultimate show business survivor. He began his career as a child star of comedy shorts and he rarely slowed down in the 80 years since his debut. Rooney was the No. 1 box office star in the world by the time he was a teenager, outdrawing even Clark Gable and Greta Garbo during his time at MGM. Rooney's career waxed and waned through the coming decades, although his tumultuous personal life always earned him tabloid attention. Rooney made a triumphant comeback in 1979 in the Broadway smash, Sugar Babies and the film, The Black Stallion. Rooney never stopped performing until he passed away on April 6 at the age of 93. 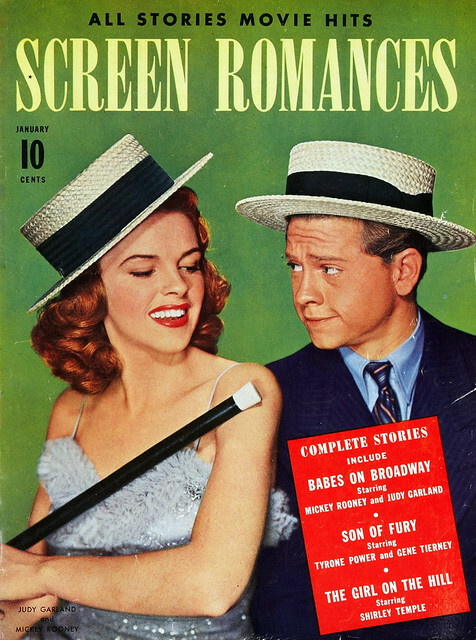 Frequent co-stars Mickey Rooney and Judy Garland share the January 1942 cover of Screen Romances. Rooney was born on Sept. 23, 1920, in Brooklyn as Joe Yule Jr. His father, Joe Senior, was a popular vaudeville comedian and his mother, Nell, was a dancer. Rooney remembered making his stage debut in a specially tailored tuxedo alongside his parents at the tender age of 17 months. A young "Mickey McGuire" in 1933. Rooney's parents separated in 1924 and Rooney moved with his mother to Kansas City, Mo., for a time. The lure of show business soon drew mother and son to Hollywood, where Rooney auditioned for the Our Gang comedy shorts. Rooney got the part, but his mother refused to allow him to perform because she believed the salary of $5 a day was too low. 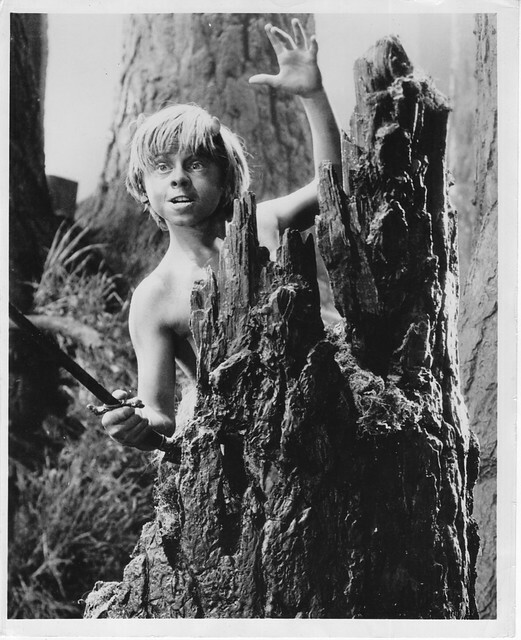 Mickey Rooney plays the impish Puck in A Midsummer Night's Dream (1935). Rooney's big break came in 1927 when he was hired to play Mickey McGuire in a series of comedy shorts based on the cartoon strip Toonerville Trolley. The pay was much more substantial this time around--$250 per film--and Rooney appeared in 78 Mickey McGuire features until he outgrew the role in 1936. The shorts became so popular that Nell began to bill her son as "Mickey McGuire" until the creator of the cartoon strip sued. Nell dropped "McGuire" and came up with Rooney after her favorite dancer, Broadway legend Pat Rooney. Father Flanagan (Spencer Tracy) leads young punk Whitey Marsh (Mickey Rooney) into the paths of righteousness in Boys Town (1938). MGM signed Rooney to a contract in 1934. He started out playing heavies opposite delicate child star Freddie Bartholomew in films like Little Lord Fauntleroy (1936), but he soon moved on to better parts thanks to his much-acclaimed turn as the impish fairy Puck in the film version of William Shakespeare's A Midsummer Night's Dream (1935). Rooney earned a rare rave review from New York Times critic Frank Nugent for his roles as street thug Whitey Marsh in Boys Town (1938). "Mickey is the Dead End gang rolled into one. 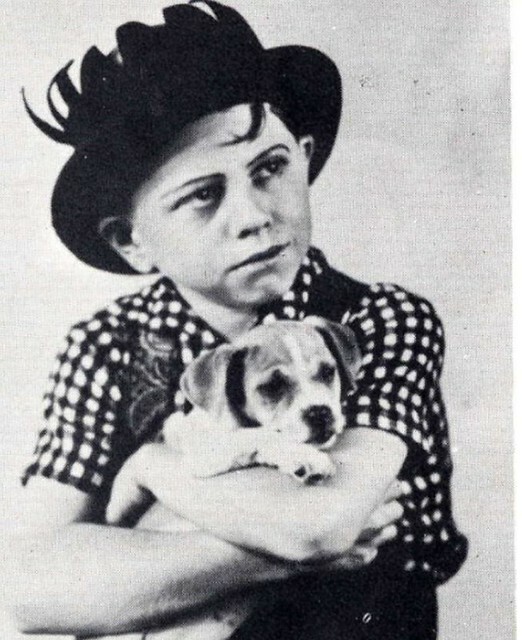 He is James Cagney, Humphrey Bogart and King Kong before they grew up or knew a restraining hand. Mickey, as the French would understate it, is the original enfant terrible." Andy Hardy (Mickey Rooney) has to choose between his girlfriend (Ann Rutherford, left) or his secretary (Kathryn Grayson) in When a Feller Needs a Friend (1941). Rooney became a superstar thanks to the Andy Hardy series. Rooney appeared in 15 Andy Hardy films between 1937 and 1944 as the all-American teenager who gets into a lot of scrapes, usually involving his love life. The irrepressible Andy always does the right thing after talking his problems over with his father, the ever-wise, ever-understanding Judge Hardy (first Lionel Barrymore, then Lewis Stone). Rooney also appeared in a series of "let's put on a show" musicals with Judy Garland that were extremely popular (We're featuring Babes in Arms (1939) as our essential pick of the week on Monday). 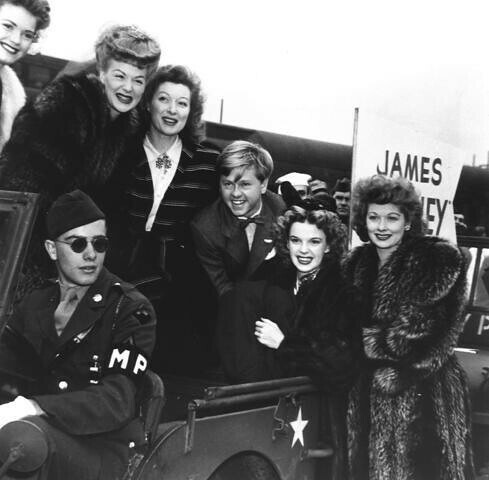 Mickey Rooney supporting the troops during World War II with (from left) Betty Hutton, Greer Garson, Judy Garland and Lucille Ball. Rooney's career faded a bit after he lost his teenage appeal. Rooney married beauty queen Ava Gardner in 1942, but that marriage only lasted one year, starting Rooney out on a rocky matrimonial path that would lead to eight marriages. Rooney served a 21-month stint in the army during World War II and he also earned a Bronze Star for his many USO tours to entertain troops in combat zones. 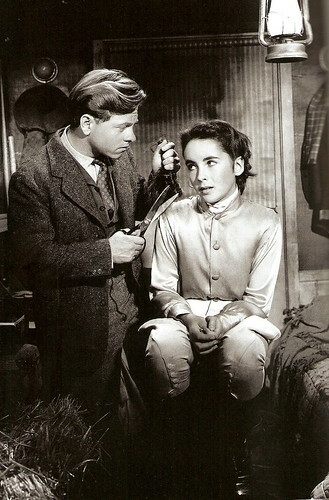 Jockey turned trainer Mi Taylor (Mickey Rooney) cuts off Velvet Brown's (Elizabeth Taylor) hair before the big race in National Velvet (1944). Rooney's career highlight in this period was his turn in director Clarence Brown's The Human Comedy (1943) as a messenger boy who must deliver War Department telegrams to families whose sons have died. That role earned him an Oscar nomination for Best Supporting Actor. Rooney teamed up with Brown again in 1944 for National Velvet, where he played a down-on-luck former jockey who trains Velvet Brown (Elizabeth Taylor) and her horse, The Pie, to victory in the Grand National. Brown always heaped praise on Rooney's acting skills saying, "Mickey Rooney is the closest thing to a genius I ever worked with. There was Chaplin, then there was Rooney. " The ensuing decades were rough for Rooney. When his contract with MGM ended, he tried starting his own production company. That didn't work out and Rooney ended up massively in debt thanks to his high-rolling lifestyle and the many alimony and child support payments that added up over the years. Rooney appeared in many films in this period, some good, some bad, but he never achieved the super-stardom of his teenage years. Rooney longed to be a leading man, blaming his short stature for his lack of good roles: Rooney once said he would give 10 years of his life to be six inches taller. He did have some plum roles in this period, including earning an Oscar nomination for his turn as a fast-talking soldier in The Bold and the Brave (1956) and he was hilarious as one of the greedy motorists after $350,000 in buried cash in the 1963 all-star comedy Its a Mad, Mad, Mad, Mad World (clip above). 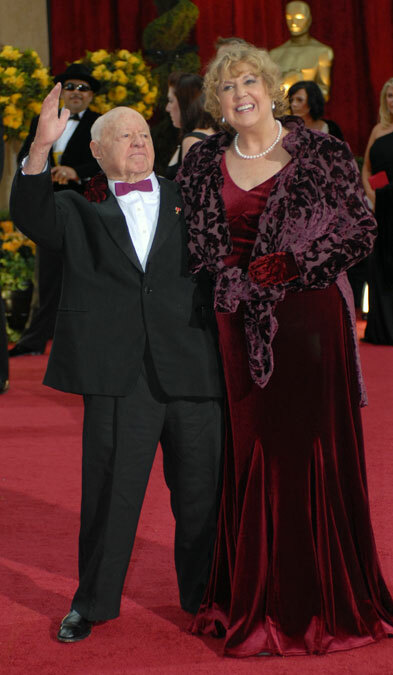 Mickey Rooney and his wife, Jan Chamberlin at the 2009 Academy Awards. Rooney's life stabilized in 1978 when he became a born-again Christian and married country singer Jan Chamberlin. The next year Rooney was a smash hit on Broadway in the revue Sugar Babies, co-starring hoofer, Ann Miller. Rooney made a triumphant return to films in The Black Stallion (1979) earning an Academy Award nomination for playing the horse trainer for a boy and the Arabian stallion he found in a shipwreck. Rooney never lost his love of performing throughout all the ups and downs of his life. "Growing up in vaudeville made me cognizant of the need to have fun at what you're doing," he told the New York Times. You can't get it done well without it being fun. And I've never felt that what I do is 'work.'" Rooney's was working on two films when he died in his sleep on April 6: Night at the Museum: Secret of the Tomb opened on Dec. 19 and Dr. Jekyll and Mr. Hyde is schedule to open on April 17, 2015. Sources for this article are Rooney's autobiography, Life is Too Short and Rooney's New York Times obituary. Go here for our articles on Shirley Temple and Lauren Bacall.